What does Permeable Driveway Systems Imply? Have you ever paid attention to the pavement surface of your driveway? If your home and the driveway is like most other homes, the chances are that the rainwater’s journey, once it hits the rook and next to the pavement, it most likely enters the street gutter. This is certainly not an environmentally friendly system, and the solution lies in creating a permeable system for the driveway. Permeable driveway systems are made of permeable paving materials or permeable surfaces that curb the amount of rainwater wastage. The rainwater on driveways is discarded into a municipal water drainage system. On the way, it picks up pollutants and pesticides before entering the street gutter. It means added pollution to waterways and extra work for water treatment facilities. This is why permeable surfaces are preferred as they allow the rainwater to trickle through and cuts down the wastage of water. The permeable driveway systems are good for the environment and thus greener in nature. 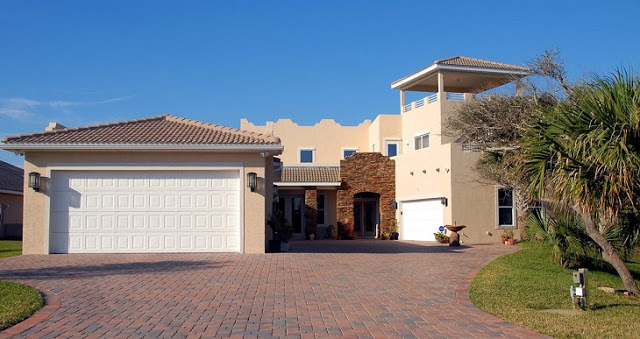 Therefore, it is essential to pay attention to the material used for the permeable driveway and look at it as an environmentally responsible move. Whether it is the driveway, the sidewalks, or parking lots, one must be careful when selecting the pavement surface and how permeable it is. It is much more beneficial to redirect the rainwater into the ground as the microorganisms there are able to digest the pollutants and thus purify the water before it enters the deep group levels. Moreover, it also helps to avert the erosion of nearby waterways. All you need to do is make your driveway greener by following permeable driveway systems. The water automatically seeps down the floor and clears off. Open-cell pavers: Here you can use concrete pavers with holes and the holes or cells can be filled with vegetation. The whole area not only looks green but is green in its functionality too. It is essential to place a solid base underneath the pavers to prevent any heaving and cracking. Previous pavers: Another common application is the use of previous paves with joints that allow an easier installation as well as easier penetration of water between the paves. Here too, one needs a sturdy base underneath the pavers so as to make the permeable driveway systems work efficiently. The Gravel: Another promising material is the use of gravel. However, one needs a stronger base to maximize its previous potential. Typically, the permeable driveway systems made of gravel make use of plastic mat made of honeycomb cells for stronger load-bearing support. For those thinking to build a strong and durable permeable driveway systems need to hire the right team who is aware of your needs as well as the latest technologies. You need to sit down with the professional team to consider different options and go for the one that works best in your case. You need to focus on the type of soil, the budget and the size of the driveway. Once you have decided upon the project and the costs, consider the right time to start and when the weather will cooperate. Construction during winters is not suggested because of the issue of frost. Typically, the coasts can range from anywhere form typically $5 to $20 per square foot.